COGR Releases "Excellence in Research: The Funding Model, F&A Reimbursement, and Why the System Works"
COGR's February 2019 Meeting Registration Now Open! Register for the COGR October Meeting Today! COGR, along with the AAMC, AAU and APLU submit their joint letter to the Environmental Protection Agency (EPA) opposing a proposed rule that seeks to limit the scientific research it will consider unless all underlying data are made publicly available. The mechanisms of competitive grant funding and peer review of publications serve to ensure the validity of science and integrity of research even when the data are not available to the public for legitimate, reasonable and ethical reasons. Restrictions related to data availability, such as the privacy of individual health information should not discount the validity of the research, or its findings, and should not prevent the EPA from using credible research in its rulemaking decisions. If instituted, the proposal will prevent the EPA from evaluating the best available evidence when making its regulatory decisions. Because of this, the cosigning organizations urged the withdrawal of the proposed rule and invite the EPA to engage with the scientific community to discuss how evidence-based policy should be developed to protect human health and the environment. Register Today for June 7-8, 2018 COGR Meeting!! Register Today for the February 22-23, 2018 Meeting! COGR has sent the following letter to Gilbert Tran at OMB. Some of your institutions have been challenged in recent single audits. Specifically, a new auditor position is that prior to billing a federal sponsor for reimbursement, the institution must have evidence that the institution’s payment to the vendor has been cleared by the institution’s bank. This is in conflict with existing policy per 2 CFR Part 200.305(b): … payments methods must minimize the time elapsing between the transfer of funds from the United States Treasury or the pass-through entity and the disbursement by the non-Federal entity. Public Comments are due October 31, 2017. The COGR letter to OMB and Mr. Tran is attached. We encourage you to submit a letter if this issue is a concern at your institution. A letter in support of the COGR letter, with any examples specific to your institution, is appropriate. DIRECTIONS FOR SUBMITTING LETTERS: As specified in an August 14th Federal Register Notice, comments should be submitted to Gilbert Tran at hai_m._tran@omb.eop.gov. Include “2 CFR Part 200.305, Subpart F-Audit Requirements, Appendix XI-Compliance Supplement-2017” in the subject line and the full body of your comments in the text of the email and as an attachment. Include your name, title, organization, postal address, telephone number, and email address in the text of the message. Comments may also be sent through regulations.gov. This is an important issue to a number of institutions and comment letters from your institution, in addition to the COGR letter, will elevate the unease around this issue. Contact David Kennedy at dkennedy@cogr.edu if you have questions on how to best craft your concerns to OMB. The October Meeting Agenda has been slightly updated for Thursday afternoon. A number of institutions have contacted COGR over the last several weeks to express concern about clinical trial case studies that NIH has posted to their website to provide guidance on determining whether proposed research meets NIH criteria for a clinical trial. Many in the research community have been surprised to find that several of the case studies suggest that some basic health-related research meets the clinical trial definition. COGR, AAMC, AAU and APLU have communicated these concerns to NIH officials. The associations also sent a letter to Mike Lauer, NIH Deputy Director for Extramural Research, yesterday afternoon detailing our concerns and requesting continued dialogue. NIH made revisions to the case studies on September 8 and has indicated that the case studies and related guidance may continue to evolve. We will keep the membership informed of any further developments. COGR joined with over 100 other organizations Monday on a letter to Office of Management and Budget Director Mick Mulvaney and Health and Human Services Secretary Tom Price to oppose the proposed cuts to NIH funding and facilities and administrative (F&A) costs in the Administration's FY18 budget. Among other things, the letter states that "If the Administration’s proposal to reduce NIH support for F&A moves forward, it will make research unaffordable for many institutions and ultimately lead to less research carried out across the country", and that "the economic impact could also be significant; communities will lose jobs, and the country will fall behind as our foreign competitors forge ahead in medical research. These consequences will hurt patients, scientists, and all Americans." As there is interest from the COGR Membership regarding materials that demonstrate the importance of basic scientific research at universities to innovation, job creation and the economy in general, we have provided a link below to the latest report from the Science Coalition which provides excellent information by university, by State, and by federal agency. The Science Coalition released a Sparking Economic Growth report that traces the origins of 302 companies – many of them small businesses – back to federally support research. The report is “intended to showcase one of the ways that federal investment in basic scientific research helps stimulate the economy." Register Today for COGR June 8-9 Meeting! The National Association of College and University Business Officers (NACUBO), EDUCAUSE, the National Association of Student Financial Aid Administrators (NASFAA), and COGR write to OMB to address a proposed new section to the 2017 Compliance Supplement: Securing Student Information, Student Financial Aid (SFA) Cluster. COGR Submits Comments/Questions to NIH on "Single IRB Policy FAQs for Extramural Community"
COGR submits comments and questions to NIH on the document 'NIH Single IRB Policy FAQs for Extramural Community." Comments are indicated in red italic text. Call for COGR Board Nominations 2017! COGR’s response to a series of six (6) DoD NPRMs updating the DoD Grant and Agreement Regulations (DoDGARs) to implement 2 CFR part 200. February 1, 2017: An overview of the changes to the revised Common Rule published in the Federal Register on January 19, 2017, a one page summary table of the changes made, and a link to the final revised Common Rule. Click here to review document. COGR 2016 Meeting Agenda Now Available! Registration Now Open for October 2016 COGR Meeting! June 9-10 COGR Meeting Agenda Now Available! Registration Now Open for COGR June 9-10, 2016 Meeting in Washington DC! COGR has recently engaged in conversations with Jean Feldman, Head, Policy Office, and Jeff Mantz, Human Subjects Research Protection Officer, National Science Foundation, regarding applications and proposals lacking definite plans for involvement of human subjects. Per 45 CFR 690.118, applications lacking definite plans, such as “projects in which human subjects’ involvement will depend upon completion of instruments, prior animal studies, or purification of compounds,” need not be reviewed by an IRB before an award is made. NSF has indicated that for studies that meet these criteria, IRBs may use a “Preliminary Approval” notice for NSF projects (see "Read More" below) and that this approval is consistent with the Proposal and Award Policies and Procedures Guide. The letter was drafted by Cindy Shindledecker and Lois Brako of the University of Michigan who have been working with Jeff and others on this for some time and we appreciate all of the work that they have done. The draft letter provides a limited approval period and indicates that the investigator must submit an amendment or new IRB application for full IRB approval of the project prior to the expiration date. It also emphasizes that no work with human subjects, including recruitment, may be conducted under the determination. Establishing a time limit, whether it is 3 or 6 months, requires investigators to return to the IRB and establishes accountability. Please contact Lisa Nichols if you have questions or concerns about the use of this draft letter. Click here to go to COGR March 16 Letter. Click here to go to the OMB May 16 response. Click here to read the full NPRM Comment Letter. Click here to read a summary of the full NPRM Comment Letter. 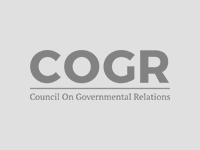 August 17, 2015 - August 2015 COGR Update COGR has published its August 2015 Update. COGR and AAU submitted joint comments on the petition to develop specific ethologically appropriate standards for non-human primates in research. COGR and AAU sent a joint letter regarding the revised draft guidance concerning controlled unclassified information (CUI) to the National Institute of Standards and Technology which was outlined in NIST Special Publication 800-171. COGR and other higher education associations released a statement expressing the view that bipartisan legislation introduced in the Senate, seeking to address abusive litigation practices of patent trolls while protecting the integrity of our patent system, was a substantial improvement over the pending House version (HR 9). COGR signed on to a comment letter to the FAA on its proposed rule for the Operation and Certiification of Small Unmanned Aircraft System. COGR sent at letter to OPERA on the request for a three-year extension of the reporting requirements set out in regulations on the Responsibility of Applicants for Promoting Objectivity in Research. COGR sent a letter to the Office for Human Research Protections on draft guidance concerning disclosure of reasonably foreseeable risks in research evaluating standards of care.